This card features my poem, "Hope," included fully on the back of the card. 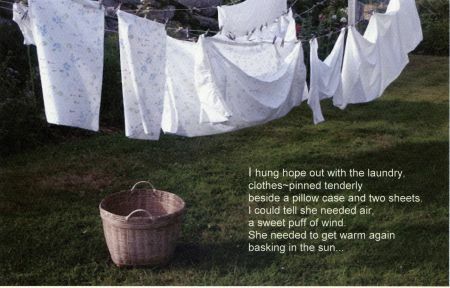 (See below for the full poem) The photograph was taken by my sister, Heather Goff- and the laundry is our mother Pam's, who still remembers how to savor the days. Mom's Laundry line also shows up on the post card "God spoke today in flowers." My own laundry is the cheery background for the poem from moonlight & remembrance, and I took the Italian laundry picture a couple summers ago. My soul just seems to delight in images of laundry.